Lock in a great price for Hotel International Prague – rated 8 by recent guests! Bet was nice, bedding was so soft, room was comfy, location good! Breakfast fantastic! Awesome hospitality by the customer relations manager, Mr. Yousef. A true gentleman!! The staff was friendly and ready to help. Rooms were well sized, clean and comfortable. Great value for money. Would definitely consider staying here again. Room lighting could have been a little better though. The hotel was lovely and the staff very friendly, I would definitely recommend this hotel and I will be returning soon. It was very close to the tram for the centre of Prague which is about a 10 minute ride. Very large hotel with great outdoor space for kids and a nice gym for working out. Nice property and 20 min from center with two trams 18 & 9. Hotel staff will give u map & tram/ metro schedule chart and helpful. Breakfast was included in our price and nice breakfast they have but no live counter. A hotel built in communist era. a little changed since that time. But it is a relativelly cheap opportunity to stay in Prague. The outside look of the building and the breakfast were good. Hotel International Prague This rating is a reflection of how the property compares to the industry standard when it comes to price, facilities and services available. It's based on a self-evaluation by the property. Use this rating to help choose your stay! 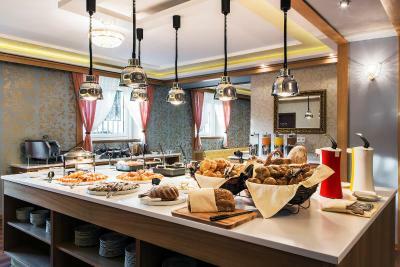 One of our top picks in Prague.Set in American Art Deco style, Hotel International Prague is located in a quiet residential area, directly opposite to the Podbaba tram station. Prague city center is 1.2 mi away and the Dejvická metro station is reachable within a 10-minutes walk. The historic building offers air-conditioned rooms with high ceilings and views over Prague. Fitness center is available on site. Guests can relax in the on-site cocktail bar and the café in the high-ceilinged lobby area that offers a unique atmosphere. Hotel restaurant Symphonia offers a number of specialties of Czech and international cuisine. Steaks are the specialty of the house. The famous Old Town Square with the Astronomical Clock and numerous shopping boulevards can be easily reached by public transport within 25 minutes. The Prague Castle district is one mile from the Hotel International Prague. When would you like to stay at Hotel International Prague? Offering free entrance to the fitness center, this spacious, high-ceiling rooms provides a bathroom, a working desk and city views. This spacious and air-conditioned room comes with a view, private bathroom features satellite TV and coffee and tea making facilities. It comes with a work desk with an ergonomic chair and offers an entrance to the Tea Lounge and a fitness center. This suite comes with views of Prague, coffee and tea making facilities, an air-conditioning, a TV with satellite channels, and a bathroom with a bathrobe. It also offers an entrance to the Tea Lounge and a fitness center. Some of these spacious rooms come with a garden view, an electric kettle, an air-conditioning nand a TV with satellite channels. It also offers an entrance to the fitness center. House Rules Hotel International Prague takes special requests – add in the next step! Hotel International Prague accepts these cards and reserves the right to temporarily hold an amount prior to arrival. The room and interior need refreshment and renovation. Shabby, somewhere dusty. Couldn’t open the window in the room. It was like a sauna at night. Joseph, (house manager I think),was an excellent host. Very friendly and informative. Excellent variety for breakfast. Everything, staff were great, bedroom was big and airy, food was nice, price was great. The lady at the reception during check-in was not willing to check with the housekeeping when the room will be ready. Other staff was nice and polite. Mised a fresh ear in room and i wish coffe was better! Friendly efficient staff , especially Josef who greeted us with " Welcome home ". Great choices for breakfast , plenty of room for guests without overcrowding . Good location for trams , buses and the underground . Reception arranged airport transfers . It’s very relaxing room and comfortable bed I can sleep very well. Fitness club next to hotel is very useful. I can workout even during biz trip. Menu at breakfast has various choices. I love everything about this hotel.